The research section of the Norwegian Cancer Society (NCS) publish popular scientific articles about scientists they support, and they have recently written about the prostate cancer research performed by professor Kristin Austlid Taskén and researcher Ian Mills. Kristin A. Taskén, leader of the Group of Urological Molecular Biology at the Department of Tumor Biology, OUS, and Ian Mills from the Centre for Molecular Medicine Norway are heading a Norwegian collaborative project for the research on prognostic biomarkers for prostate cancer. 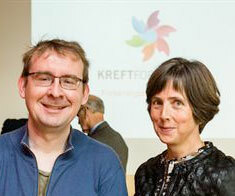 The project gather 26 prostate cancer researchers in a community - The Norwegian Prostate Cancer Biomarker Consortium.